The odds for the Oakland Raiders football team’s relocation to Las Vegas are looking very good right about now. Nevada Governor Brian Sandoval signed a bill into law this week that would set aside $1.15 billion in public funds to build two new mega-projects in Las Vegas: a new Manica Architecture–designed Las Vegas Raiders stadium and a large-scale upgrade to the Las Vegas Convention Center. 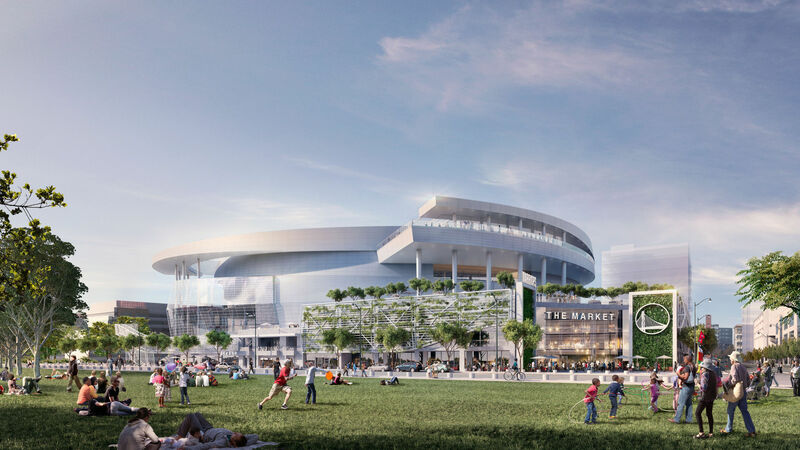 In the deal, the stadium would get $750 million in funding with the remainder going toward the convention center project. Nevada lawmakers narrowly approved the bill in a special legislative session last week, capping off several months of deal-making and buzz for the nearly $2 billion project. Of the remaining sum, local billionaire Sheldon Adelson intends to contribute $650 million in funding, with the team putting roughly $500 million toward the project. 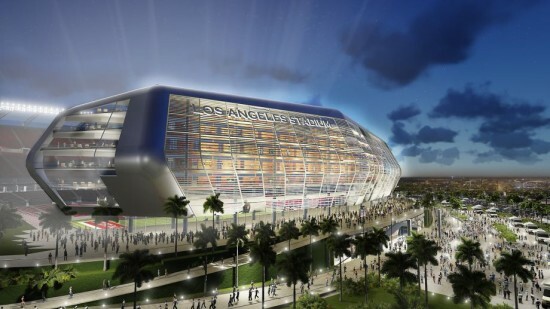 Manica Architecture’s proposal for the 65,000-seat stadium has been mostly repurposed from the team’s failed bid to relocate to Los Angeles and features a large, retractable roof canopy. The arena would be located on one of two sites, both adjacent to Interstate-15 and the Mandalay Bay casino towers. One of the proposed sites is located on top of what is currently a portion of the Bali Hai Golf Club. The deal marks the largest amount ever in terms of sheer dollars that a municipality has provided to subsidize the building of a National Football League (NFL) franchise stadium. Construction Dive reports that several concessions were made in order to have the legislature approve the deal, including increasing the amount of access the University of Nevada, Las Vegas would have to the stadium and providing a different rental rate to the university for access to the facilities. In a boastful ceremony marking the signing of the bill, the Sandoval cited inter-city competition as a driver for the funding plan, stating, “Cities such as New York and Chicago and Seattle, they have not only stadiums and major sports franchises, but are also investing over a billion dollars per year in their respective convention centers.” Sandoval’s approval marks the penultimate step in the Raiders’ bid to build a new stadium for the franchise. In order for the move to become officially-sanctioned, two-thirds of current NFL franchise owners would have to agree to allow the team to relocate in an upcoming meeting scheduled for January 2017. 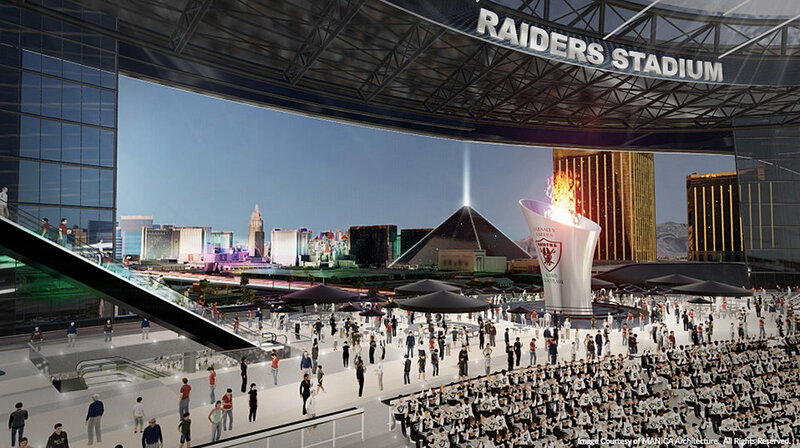 Las Vegas is one step closer to getting its own football team and stadium. Yesterday, The Southern Nevada Tourism Infrastructure Committee (SNTIC) unanimously approved a bid for $750 million in public funding for the Manica Architecture-designed project. The decision infuses the itinerant team and it's stadium with a higher potential for realization, but there are still many questions to be answered. SNTIC’s support punts the stadium issue over to Nevada’s Republican Governor Brian Sandoval, who must now convene a special legislative session to approve the funding request. Public financing for the project would be a contingent on the legislature increasing the Clark County hotel tax, perhaps a difficult proposition in a Republican-leaning state where the governor is up for reelection. In a statement released by the governor, Sandoval pledged to hold off deliberating on the matter “until all questions have been resolved,” adding “Nevada has served as the standard bearer for global tourism, gaming, and conventions for decades. In order to remain the top destination, we must explore potential opportunities and push forward to lead this international industry into the next generation of travel and tourism. I am hopeful the work completed by this committee will serve as a roadmap to Southern Nevada’s unrivaled and continued success.” Manica Architecture’s proposal for the stadium, transplanted from an earlier, failed bid the Raiders made for a new home in Los Angeles, is projected to cost nearly $2 billion. 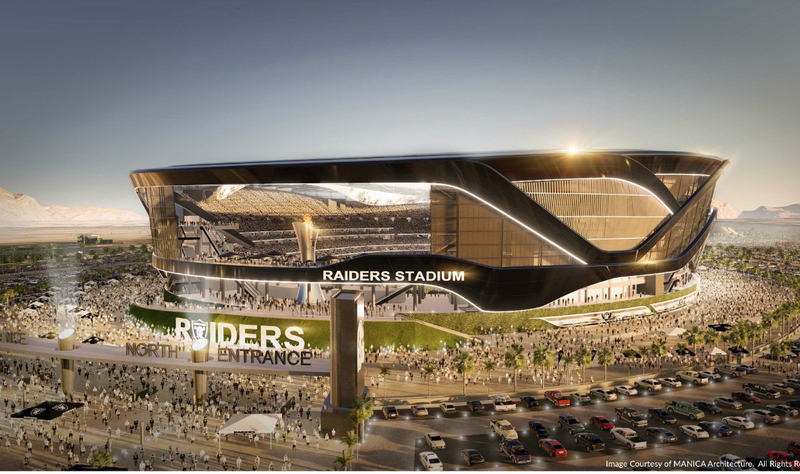 Developers for the project consider the $750 million in public funding essential to building the stadium and bringing the team from Oakland to Sin City. 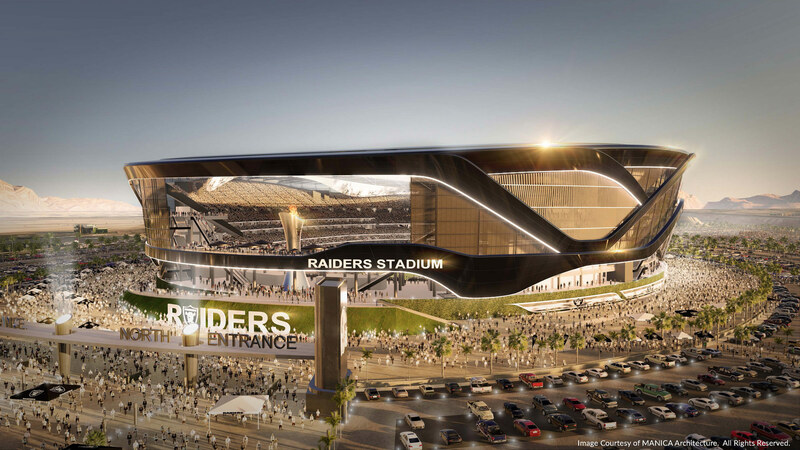 The stadium proposal features a massive, retractable roof canopy that would shield the stadium’s 65,000 spectators from the blazing desert heat and aims to connect with the adjacent Mandalay Bay casino and the remainder of the Las Vegas Strip. The final site within the city for the potential stadium to occupy, however, is yet to be finalized. The team is eyeing two adjacent lots hugging Interstate 15: A compact scheme to the west of the Mandalay Bay casino towers, and another, more expansive one to their south. The southern scheme would require partial demolition of the Bali Hai Golf Club but would ultimately consist of a more heavily-landscaped proposal featuring expansive of surface parking.